We are now in a digital economy. We use our mobile phones and everyday new innovations are developed. Regardless of size you're not protected from the disruption that is happening. To achieve digital transformation you need to make the time otherwise you will be out of business. Digital transformation is enabled by technology but driven by people. This includes founders, employees, customers, suppliers and partners. As a small business you don't have the resources to hire a "Digital Transformation Officer". The customer you are losing some of the opportunities [to learn from customer feedback]. To feel a part of the ... (not sure what she said here). BIC pens in a meeting asked the question.. Why not make razors? Look at your business. When Spirit airlines started they started as a low-cost carrier with now assigned seating. You need to understand the world you live in, not just your business. Understand your customers and look at how to solve their problems. unauthorized internal access to individuals' personal data. In the future you'll be able to do onboarding online, sign contracts online, possibly use biometric authentication at Automated Banking Machines. Very high confidence Low risk of fraud. LIfecycle change data sharing - marriages, deaths etc. Reduce corruptions; increase innovation; increase transparency; Public Private Partnership to build it out. can reach 50 million users faster than ever. Radio to 38 years to reach 50 million users while smartphones took less than a year to do the same. Digital is fundamentally changing the way things work along the value chain. Digital maturity correlates to financial metrics. The mindset needs to be different, even as a developer. feedback and adjusting based on feedback. We're moving away from an "organisation as a machine" to "organisation as organic system". What is your big dream that you're going to bring back to your organisation and really push the thinking? Examples, blockbuster, kodak, airbnb vs hotels etc…. Examples, Estonia, Alibaba, Transferwise. It is no longer "owned" by Silicon valley. At NCB we believe we can leverage, mobile technology, open source technology to meet our objectives. It is not about a new App, Website, becoming Paperless, ERP or CRM. the transition from a product centric business model to a customer journey centric platform model, characterised by simplicity, ease, speed, convenience, elight and powered by digital technology, artificial intelligence and partnerships. A good example is John Deere who moved from a manufacturer to a platform. How do we become more concerned about the customer journey? 2015-2016 - defined our ambition, launched new digital products, evaluated and refined approach We borrowed from Jeff Bezos, be more customer focused. We launched a few digital products and learned some lessons to help us refine the approach (not the ambition). With that introspection we decided we needed a new approach. It was taking us too long to get to market and we needed to do something different. 2017 - Launched 1st Agile Lab, Accelerated digital transformation, evaluated approach. By the end of 2017 we had 4 agile labs. 2018 - We scaled up and we are now at 15 agile labs. IT is no longer in a silo, cross functional teams are collaborating on common goals. These are not senior people. We constantly test solutions with the customer instead of a big role out and feedback later. Every week or two weeks we do internal demos and every 4 to 6 weeks we test with customers. We launch in increments and test. For example our account opening solutions addresses 40% of our customers. Instead of waiting we're rolling out in increments. Example.. We've partnered with eGov so we can plug in to their data to pull customer information to save them the time of filling out a form. We went from a total of 20 application developers to needing to recruit 30 in the first year. We partnered with local IT companies who were better at getting talent. When we looked at the pipeline of talent that we needed there wasn't enough talent. We partnered with the University to help to prepare talent. Not just developers, data scientists and UX professionals. We had infrastructural issues. If you have ICT based platforms and FLOW goes down that's a problem. It is not a resources issue, it's about leadership and commitment. This requires a huge cultural transformation from "this is how it is done" to how we focus on what the consumer needs and wants and how to get there. We are proactively putting this in place to protect customers. If it doesn't sound like science fiction it isn't crazy enough! Remember the disruption may come from outside your industry. Choose a journey that will impact your customers and business but not something that has too much technical or ecosystem dependencies. This allows you to develop the muscle and then you will have an early success story to use as a case for change within your organisation. Once you have that quick win then you can scale up and address other areas of your roadmap. This is a process of continuous improvement and continuous learning. We would love to become the Google of the region or the world. The CEO spoke to some important components of that. What is strategic digital leadership? Answer… it's about the relationship/partnership between the leaders. The skills needed for the CIO is not just about the technology. That myth needs to go away now. 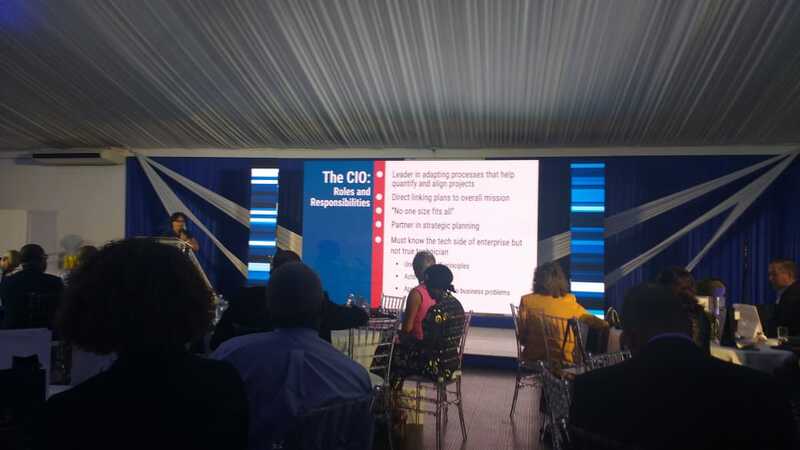 It is important that the CIO acts as a strategists on how to use technology to address business issues. It is important that the partnership is developed and the CEO pushes the [digital] agenda and support the work of the CIO. It's NOT about the technology. The technology is a part but it is the integration of the technology with the strategy. How does the technology become a part of the strategy. You have to develop the capabilities needed and invest in your talent. 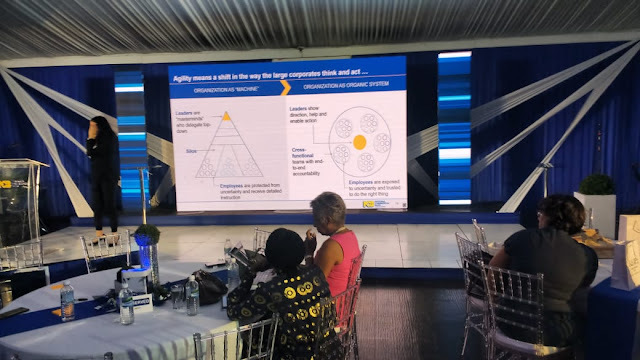 NCB has been very strategic in this, they've come to the university to engage to make sure graduates are coming out with the skills they need. To quote Lego on digital transformation - "No more digital strategy - executing strategy digitally"
It's note an option now for companies it is an imperative. Some of these changes don't require large investments so it can impact small players as well. It requires a change in mindset. It isn't the same for all. It is important to define it. Remember Blockbuster vs Netflix. It isn't about the big fish, it's about the fast fish. Netflix disrupted the video rental industry and killed Blockbuster. Most organisations didn't have a clear digital agenda. Most organisations (53%) considered themselves developing, which I think is optimistic. You have to be open to this kind of radical change. Leadership is essential, you need to expand the role of mobile and mobility (how are your customers consuming your data and information). I want to congratulate NCB. This symposium is a critical success factor. I've been discussing how we in education have to embrace technology. Our prime minister is passionate about digital transformation. We are in the business of developing our human resources. We need to ensure our system is producing the humans needed for this change. We are seeing ICT innovations with IoT, Artificial Intelligence, Virtual Reality and Augmented Reality, Big Data and Blockchain. The united nations has as sustainable development goal "Quality education". Putting on my HR hat, I've been advocating a mandatory 30 hours of professional development for every employee to promote lifelong learning for all. This aligns with our strategic plan vision 2030. Was a forerunner in implementing a digital school management system at Jamaica College, there was a time when we had to enter grades on broadsheet paper reports, now you can be [anywhere] and upload the data. CXC is moving to digitally delivered exams. Eventually students won't need to travel to exam centres to do exams. You can stay home with your smart device and do your exam. We can have a master teacher teach the whole country and help to address the "teach shortage". Campion College is leading the way in flipping the classroom. 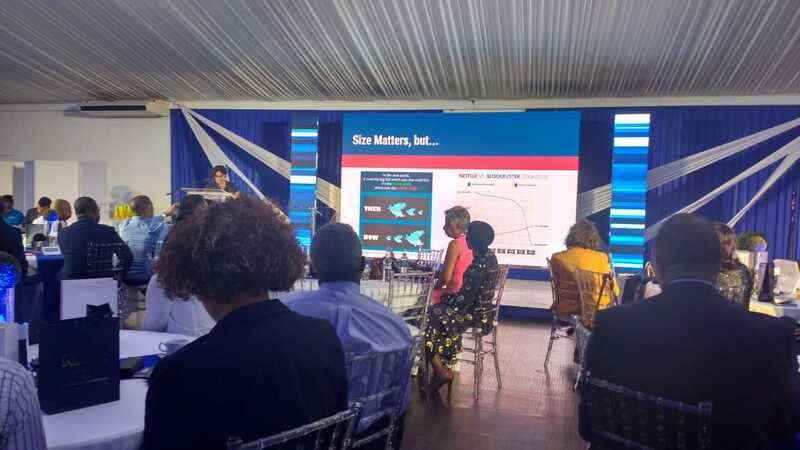 Addressing Patrick Hylton "I expect NCB to match some of the things I'm doing in the education system"
These strategies form the [foundation] that will help the ministry to address the needs to meet the needs of the labour market. Not just catch up but leapfrog! We were leaders in the 1960s and we have the opportunity to leapfrog ahead of Estonia. We don't want to just be like Estonia, we ant to be better. Most education systems are based on models implemented over a century ago. Digital transformation is causing… new jobs requiring skillsets. You will soon benefit from the new Jamaican creative minds. Less than 5% of companies on the stock exchange declared an explicit digital agenda. To improve the delivery of services etc..
As I reflected the following occurred to me. It is difficult for incumbents to engage in a process of significant change. For many reasons but I won't go into that this morning. "An aspiration is the main fuel for progress". Aspirations have the ability to transform ordinary people into extraordinary achievers. We decided in 2015 to begin our transformation. We appointed a Chief Digital Officer. You have a blank sheet… dream big. In 2017 we accelerated by adopting agile as a methodology, initially limited in scope with an now [we're going for ] agile at scale. We find things difficult to execute because we're trying to make changes and be constrained by the current context. There is no such thing as mature markets. We have mature products and ideas but there is always opportunity to disrupt (via digital). I often reflect on companies like Kodak and Nokia. I was reading the comments of the chairman of Nokia when they were being acquired by Microsoft "We did nothing wrong, but we lost". The danger of not transforming is that others will force you to transform or exit. There is danger on one side and opportunity on the other side. By embracing the change you have the opportunity to disrupt and have others feel the power of your execution. There is a transformation that [needs] to take place at the corporate level. 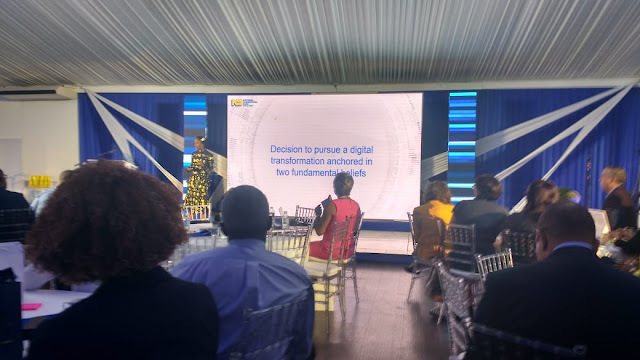 For us, NCB, to optimise our own digital strategy it is best facilitated by an ecosystem that is digital in nature. There will be difficulties and challenges but one of the benefits of this type of transformation you are not limited by geography. Resources are a limitation but not as limiting as your mindset and discipline. I like frameworks, then I came across a quotation from Warren Buffett. "To become an successful investor it does not require a [super] IQ but it requires a framework and the discipline to stick to it"
I tell my colleagues that every time I see challenges I get excited because it gives opportunities to create value. So I watch it every morning and come out crazy. I was reacing about the characters in the ad. One of them, a wrestler, born without legs also runs track and plays football (see: https://abcnews.go.com/Sports/year-born-legs-finds-success-wrestling-team/story?id=48643569). (more discussion of the athletes in the ad). In closing, I want to leave you with some words… voice by an american architect Daniel Burnham. "Make no little plans; they have no magic to stir men's blood and probably themselves will not be realized. Make big plans; aim high in hope and work, remembering that a noble, logical diagram once recorded will never die, but long after we are gone be a living thing, asserting itself with ever-growing insistency.…"
The power of digital is that it puts the power in our hands… We have no excuses.